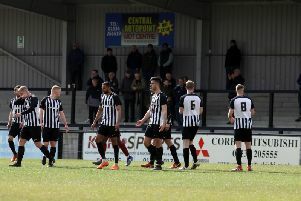 Tommy Wright believes the “characters” in his squad have a key role to play as Corby Town bid to get their season back on track this weekend. The Steelmen head to North Ferriby United in the Vanarama National League North tomorrow (Saturday) looking to end a run of nine games without a win in all competitions. Their latest setback came on Tuesday night when they were dumped out of the FA Cup as Rushall Olympic triumphed 2-1 in a second qualifying round replay. Wright responded to that by hauling his players in for an extra training session on Wednesday night as well as announcing the return of winger Wilson Carvalho to the club. The Corby boss believes his squad will have a stronger look to it this weekend with Carvalho, Herve Pepe-N’Goma and Leicester City loanees Cedric Kipre and Aaron Hassell all set to be included. But he knows that if the Steelmen are to turn things around then his experienced players will hold the key. “The boys are fine and we have some big characters in there like Cleveland Taylor, Duane Courtney, Greg Mills and also Paul Malone who is still in and around them,” the Corby boss said. “I pulled Cleveland and Duane in before we trained on Wednesday because they are my leaders and I asked them to do what they do best and lead. “They need to be loud and bubbly on the training ground for us and they have done that since Tuesday night. “On Wednesday night I had the boys doing defensive corners for an hour. I explained why we needed to do it and they bought into it. “We need to spend a lot of time on the training ground because the statistics don’t lie. “We have conceded the second highest number of goals in the league and it is a concern. “We have work to do on certain things and we will be tying up a few loose ends before we go to North Ferriby because it’s going to be a tough game. Mills is again likely to miss out tomorrow due to an ankle injury while Anton Brown (dislocated wrist) also remains on the sidelines.